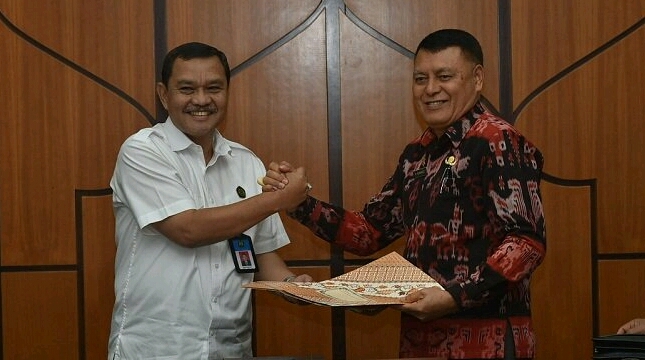 INDUSTRY.co.id - Jakarta - In order to optimize the potential of natural resources, the Ministry of Energy and Mineral Resources (ESDM) through the Geological Agency signed a Memorandum of Understanding (MoU) with the Government of East Nusa Tenggara Province (NTT). The scope of this cooperation includes, research and development of geological heritage, geological preserve, geological disaster and environmental geology. Improvement of human resource capability, and other related activities and agreed by both parties. The signing of the MoU was conducted by the Head of the Geological Agency, Ministry of Energy and Mineral Resources Rudy Suhendar and Assistant I of the East Nusa Tenggara Provincial Secretariat, Mikael Fernandez, at the Ministry of Energy and Mineral Resources, Jakarta, Monday (2/7/2018). Rudy hopes that with this cooperation both parties can improve research and services in the field of geology that can provide the greatest benefit for the people of Indonesia. "Let us intend jointly to do a good cooperation, which later involves the Geological Agency or involves other sub-sectors, whether it is with the Directorate General of New Energy, Renewable and Energy Conservation (EBTKE), DG of Electricity or oil and gas, all of which we can later facilitation so that all smoothly, "said Rudy. Cooperation is also expected Rudy will continue to run today and in the future so that both parties get good results. "I am grateful to have worked on this MoU activity, I am on behalf of all the Geological Agency of the Ministry of ESDM to thank the NTT Provincial Government's willingness to cooperate with us, because we without cooperation cannot do anything and produce nothing," he said. Continued Rudy. Assistant I of the East Nusa Tenggara Provincial Secretariat, Mikael Fernandez, said that the cooperation between NTT Provincial Government and Geological Agency is important because NTT has a lot of natural resources that can be developed. "We are in a powerless area, we may have natural resources, but we do not have technology, and second, we do not have enough human resources to manage it," said Mikael. According to Mikael, for the people of NTT province to be developed then the natural resources must be managed and developed to provide benefits for the community. "We have to manage the natural resources if we want to move forward, we have to manage, what the mine means, only the story, until today we cannot manage," said Mikael. The area of ​​East Nusa Tenggara Province holds a lot of potential of ESDM sector that can be optimized, for example in the field of geology, among others, the first and oldest human fossil research in the Soa Basin, Ngada District, Flores, NTT, which does not close the possibility of research location can be used as geopark. "NTT is able to advance with other provinces in Indonesia, because we have a lot of potential, but we have not managed well and for us to move forward we are cooperating with various parties," lid Mikael.